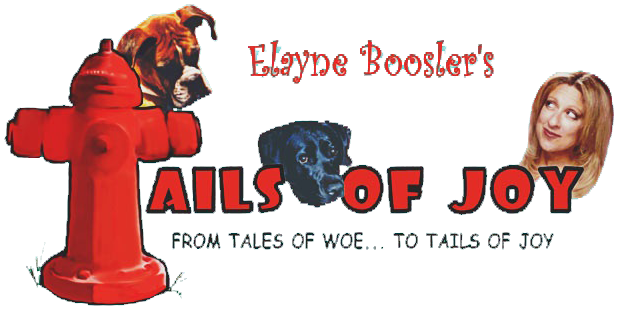 Tails of Joy is a not-for-profit 501(c)3 animal rescue organization founded in 2001 by comedian, writer, and animal activist Elayne Boosler. (Catch up with Elayne.) We are all volunteer, so 100% of every dollar of every donation and purchase is used to save animals’ lives. TOJ raises funds for the smallest, neediest rescue groups all across the United States, and beyond. With our daily “Little Guy Grants“, we keep the small rescue groups in your community from falling through the cracks when there is nowhere else for them to turn. In addition to hands on animal rescue, we are here to rescue the rescuers. In this way, we have helped save the lives of tens of thousands of needy, abused, homeless and neglected animals. When there’s an emergency, we’re their first call and their last chance. We provide assistance, boarding, medical care, shelter fees, food, training, supplies and transport, for desperate animals, often on what would be their last day of life in a shelter. We also help needy individuals with pet emergencies. And we have a dedicated spay/neuter fund, our “Edith and Julie’s Spay and Neuter Fund at Tails of Joy“, which not only pays for pets’ spay/neuter across the country, but also funds the TNR (trap, neuter, release) of feral cats in many communities. We are here for rescue emergencies; from animals getting hit by cars, to small groups’ broken water heaters, food shortages, materials for kennel runs, whatever it is to keep them from falling through the cracks, we are here. 100% of our income rescues animals. The only way you could donate to help animals more directly would be to hand a dog or cat five bucks. But we don’t just rescue dogs and cats. We help rescue bunnies, horses, burros, small exotics, big cats, primates, wildlife, sea life, farm animals, elephants, bears.. we help them directly, or help the groups that do. Our goal, with your help, is to make the world better for animals and their people. “Elayne Boosler – Timeless” Boxed Set Available Now. Five hours of great comedy benefitting animal rescue. Four DVD specials and a new CD. Thank you Wiley Miller, creator of Non Sequitur and champion of animal rescue. Leon Wagner (right), generously put together the new Tails of Joy website, and has also spent many years supporting Mutt Match L.A. and Much Love Animal Rescue. Leon is president of the software company FORTH, Inc. John Hesse (left), owner of Seven Colonial donates a percentage of its sales to animal rescue groups, including Tails of Joy. They live in Los Angeles with their three rescued dogs, Gunnar, Ruby, and Rosie. This is Tiger. He spent 7 years outside on concrete at the end of a heavy chain, never knowing a moment of kindness. When the people moved away and left him, the new renters gave a neighbor the weekend to find him a place to go, or be killed. Several rescues, including us, banded together to find him a perfect, loving home. He is truly our Cinderella poster boy. Tiger with Elayne at an adoption event. Tiger in his new home. *Slogan courtesy of Marco A. S. Freitas. Join our pack and be the first to know about events, great new items, and useful news. Get discounts and first choice. Unsubscribe at any time. We never share your info with anyone, even if they offer us a peanut butter cookie. And we won't hound you (ouch).